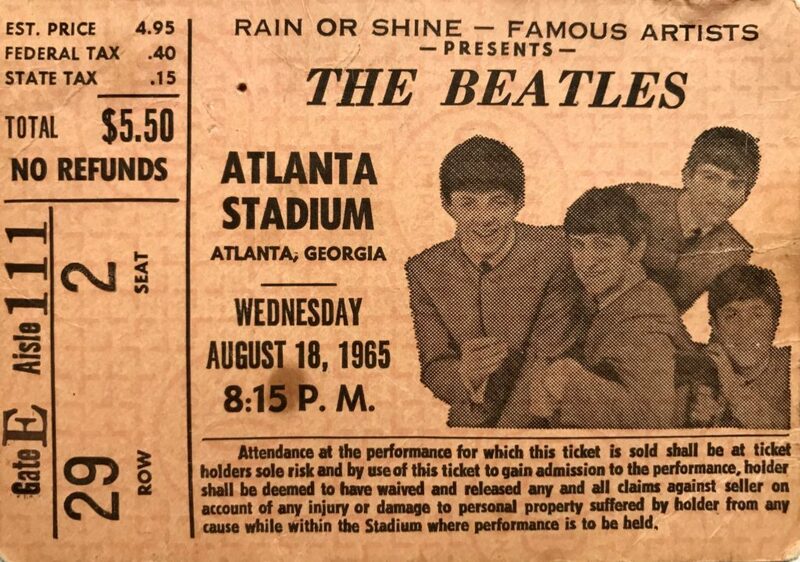 August 18, 1965 at 8:15 I was sitting in the Fulton County Stadium in Atlanta Georgia waiting to see The Beatles. That’s right, The Beatles. The story I recount below is pulled from the dusty memories of an impressionable 11 year old. The stadium was completely sold out. Walking to our seats below the stands, the noise rose in volume as we approached the gate to our seats on the field level. As we moved through the gate into the stands the sights and sounds were astounding. Girls, mostly late teens into their 20’s, were standing in their seats screaming at the top of their lungs. The Beatles were an hour and a half from playing. Hands over their faces, some tearing, hugging the person next to them as in disbelief they were there. I am sure they were. The stadium formed a circle around what was normally a baseball playing field. Immediately inside the perimeter guardrail separating the seats from the field were 3 concentric rows of police officers locked arm and arm around the entire circle. Behind the three rows of police were several random groups of officers moving around. In the center of the field was the stage flanked by two walls of speakers maybe thirty feet high by twenty-five feet wide. My memory is faded a bit here, but I remember a warm up act took the stage first, mostly consisting of dancers in pink costumes, dancing to generic recorded pop music. The screaming continued at the same deafening level as when took our seats during the entire warm up show. When you thought it could not get any louder, the stadium light screens consisting of lighted bulbs would flash the names John or George or the other Beatles and the decibel level of screaming would rise fifty percent. Finally a garage door to the right of me across the field opened and a black limo entered the field and pulled behind the stage. “The crowd went wild”. It was totally deafening, totally chaos. Girls now were standing their seats screaming louder than I thought possible. You could not hear the person sitting next to you, my aunt by the way who took me to the show. As they took the stage one notch below total pandemonium set in. Many girls left their seats and ran down the isles toward the field and jumped the guardrail into the rings of police. The police would grab them, as they struggled to break through the police line to the stage, by their hands and feet, swing them and throw them off the field back into the stands. The show started and the screaming was absolutely deafening and you could not hear one note of music coming from the walls of speakers. If Paul or George blew a kiss to the crowd hundreds of girls would faint and fall into the seats in front or back of them banging their heads and would be bleeding and passed out. Paramedics would rush in pick them up on stretchers and carry them up the aisles and lay them out on the floor below the stands. Medics would then run for the next one. The Beatles played for about twenty minutes and I never heard one note or sound from the stage. My impression watching them as they played was they were in some ways enjoying it, but at he same time terrified for their lives. I believe absolutely if the police lines had failed the girls would have rushed the field and literally ripped them to shreds. The Beatles seems greatly relieved rushing off stage and into in the limo: they were alive. This article was submitted by our guest blogger Hugh Davis. Hugh, lives in Palm Beach plays bluegrass guitar and is currently a fretmentor student. 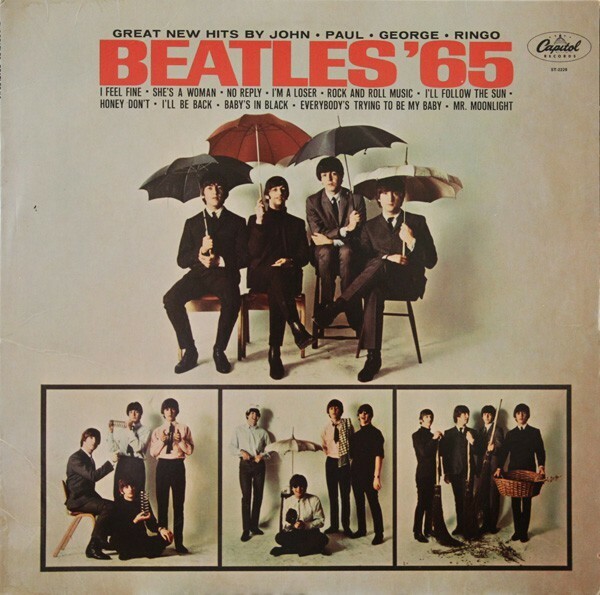 This entry was posted in Concerts & Festivals, Guest Columns, History, News & Events and tagged The Beatles. Bookmark the permalink.